I just received a replied sms from Mashafizul (photo right) stated that he's not sure whether to play in the next international tournaments ( KL Open and Singapore Open) because of his father unfortunate health condition is getting worse. I feel sad for Mas situation who is desperately seeking for his GM norms and at the same time face this unfortunate situation . 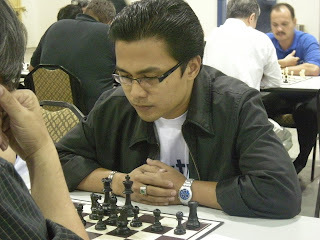 I believe that he has played in difficult situation since DATMO 2008 and then follow by series of tourney such as the MCF GM Tournament 2008, Commonwealth Championship in India and Dresden Olympiad recently. I hope that his father will get well soon because he must surely be the no.1 supporter for his son GM quest.